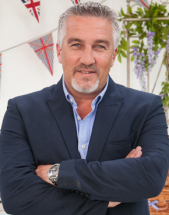 Paul Hollywood is one of the UK's leading artisan bakers. The son of a baker, Paul originally trained as a sculptor until his father persuaded him to change careers. By combining his love of sculpting and baking, Paul established himself as an innovator. Paul is a Master Baker and has worked in some of the most exclusive hotels in the world including the Dorchester in London. He cemented his reputation as the leading authority on bread making by publishing the best-selling book "100 Great Breads" which has been translated into seven languages and was named as the 'Top Bread and Pastry Book' of 2005. In 2008 he created the most expensive bread in Britain - an almond and Roquefort sourdough that was sold for £15 a loaf at Harrods, which Paul describes as the "Rolls-Royce of loaves!" In 2013 Paul presented his first solo series, "Bread," on BBC2, in which he revealed the secrets to making breads from all over the world, and how a simple loaf can be transformed into delicious dishes for breakfast, lunch and dinner. Paul also appeared as a judge on "The American Baking Competition" on the CBS network. Alongside Mary he has also judged the "Junior Bake Off" on Children’s BBC.